(i) Wherever the words “engine whistle” appear in these rules they also refer to “engine horn”. Signals prescribed by this rule are illustrated by “o” for short sounds; “___” for longer sounds. (#) Alarm for persons or animals on or near the track. -operating at 44 MPH or less, in order to provide 20 seconds warning prior to entering the crossing. Whistle signal must be prolonged or repeated until the crossing is fully occupied. (ii) (#) At other whistle posts indicated in special instructions. (iii) (#) At frequent intervals when view is restricted by weather, curvature or other conditions. (iv) Special instructions will govern when such signal is prohibited in whole or in part. (ii) approaching and passing station facilities, yards and public crossings at grade. In addition, the movement must not exceed 25 MPH entering each public crossing at grade which is not protected by automatic warning devices, until such crossing is fully occupied. So, there are the rules. Now it gets even more complicated. An article from the Vancouver Sun from last August clearly shows the dilemma of whistling, for both residents and railways, and perhaps explains a few of the emails we’d received from around Surrey, B.C. The article notes that some residents in a part of Surrey were being woken up due to an apparent increase in the frequency and duration of the use of train whistles by Southern Railway. Southern Railway’s director of community relations and chief mechanical officer, J. Singh Biln, was noted as having received numerous complaints, all from residents living near the tracks in one fairly specific area. For the record, Southern Railway has tracks and operates through the communities of New Westminster, Surrey, Langley, Abbotsford and Chilliwack, in B.C.’s Lower Mainland. Biln explained in the article about the requirement of train operators to sound their whistle at every crossing, whether or not it’s controlled, and also noted that the engineer has the discretion to blow the whistle longer if there are people or vehicles near the track. Biln attributed the more frequent use of whistles in the area due to train operators having to alert an increasing number of homeless people living by the tracks of an oncoming train. Southern Railway also spent about $25,000 during that period to hire a company to help move the campers along and clean up their mess. According to Transportation Safety Board data for all railways, by August alone of last year there were 26 trespasser fatalities in Canada. “When they’re that close to the tracks, it’s very, very dangerous,” said Biln, adding that he’s also seen large items left on the tracks that have the potential to derail trains. Surrey’s manager of bylaws and licensing services, Jas Rehal said that he was well aware of the city’s homelessness issue and of the fact that people were camping near the railway in increasing numbers. 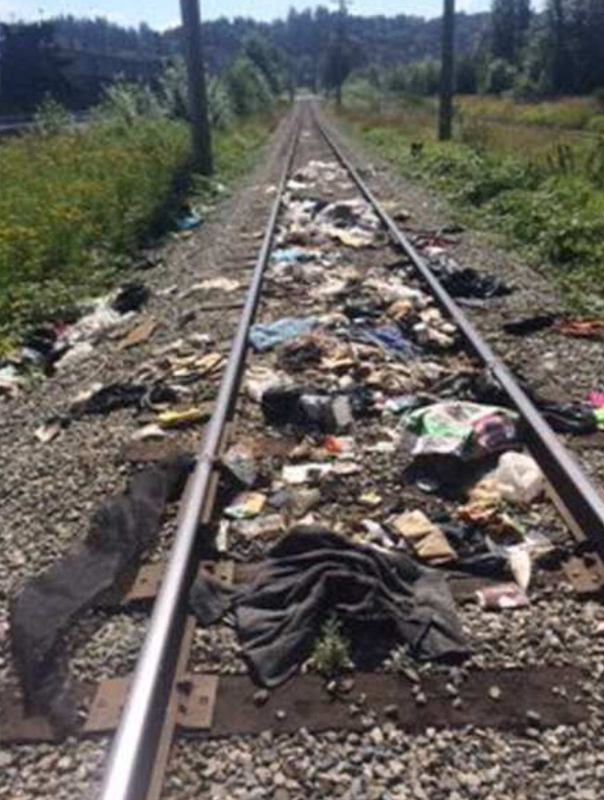 Rehal noted that the city of Surrey has maintained a good relationship with Southern Railway and that city bylaw officers had visited the campers to try to assist them, as well as explaining to them the dangers of trespassing and camping by the railway tracks. Biln noted that Surrey is not the only B.C. Lower Mainland community facing this problem. Nearby Abbotsford, B.C. has had people camping along Southern Railway’s tracks for years, while Chilliwack has faced similar concerns. If there is any silver lining to this story, it is in Biln’s openness about the importance of the city continuing to work with the railway in order to keep the area’s homeless people safe, and not just move them along to the next camp. “We need to work together toward a social solution rather than heavy-handed,” said Biln. And, maybe that way, everyone, and we do mean everyone, might be able to sleep just a little bit better. I live in Ashcroft , we get one (edit) engineer who blows his stinking horn from one end of town to the other! A little courtesy and common sense goes a long way , you folks seem to have none . A train traveling at five or ten miles an hour thru a siding should be depending on their brakes , not an air horn ! Grow up ! It’s not the first time that we’ve heard about this happening, not from your area, but in general. Unless Ashcroft has whistle cessation in place, the crews, by law, must sound the whistle. However, if this particular person is “overdoing” it according to the rules we’ve already detailed, then it is possible to ask if Transport Canada could look into the matter. We believe that there is an urgent need to come up with an updated signalling system, especially at night, that maintains rail safety while reducing the impact on human health through sleep disruption.